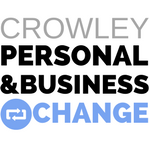 In 2012, I opened Crowley Personal and Business Change a private coaching, HR, training and development practice specialising in training, developing and coaching executives, individuals and teams both within and outside the organisational setting.This includes life and executive coaching as well as HR Projects. Over my 25+ year career, I have worked with people to maximise their options for personal and business success, in a variety of organisations including technology, FMCG, customer-driven retail/owner-managed businesses, services, public bodies and manufacturing. Working from Cork, I went to UCC and qualified with a BA, H.Dip.Education in 1984. Having set up my own business in the educational field I became interested in human resource management and went into industry in 1989. Since then, I have worked in Human Resource Management, Coaching,Training and Development in a variety of senior executive roles in companies such as QC Data, Musgrave Retail Partners, the Irish Management Institute and Eli Lilly. While working in industry, I became qualified in HR and in Training and Development, with the CIPD and with an MSc. in HR/Training through the University of Leicester. I became a qualified Coach in 2008 with a Diploma in Coaching through NewCastle College and have added on a number of additional qualifications since then including a Diploma in NLP (neuro-linguistic programming) and the EQi.20 (emotional Intelligence) Accredited Practitioner in indiviudal, leadership and 360 degree reporting. In addition to extensive training and development initiatives, I have successfully coached a variety of clients from individuals seeking personal fulfillment to senior executives with career and work performance challenges. My approach is simply to meet your needs by conducting thorough and complete needs assessment and then to use whatever methodologies are most useful in meeting those needs so that you can achieve long-lasting personal, career and organisational change. Some of the developmental methodologies I have used include: individual coaching, group coaching, peer coaching, training workshops and materials, assessments such as Emotional Intelligence psychometrics, personality testing, self-observation and NLP (neuro-linguistic programming). I absolutely love working with people and have always worked with others to support them in their own growth, whether that is teaching, human resource management, training, consultancy or coaching. I aim to work with you on helping you identify your own goals and then support you in reaching them, whether that is an individual aim or a collective one within the organisational setting. Some of my ideas and approaches can be read in my blog posts and on LinkedIN, for example: ‘why I love to coach‘ or read what my clients have to say about their experiences, for example: career change. Make contact with me for a confidential chat or send me an email on: crowleyannem@gmail.com, and together we can help you move forward.